Chef Gavin Kaysen's restaurant opens later this year. 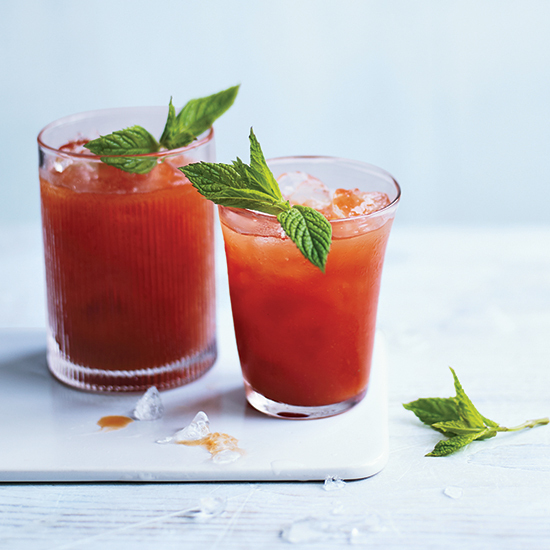 Here, he shares his outrageously delicious tomato water Bloody Mary recipe. Chef Gavin Kaysen's restaurant, Merchant, opens later this year in Minneapolis. Here, he shares his outrageously delicious tomato water Bloody Mary recipe. In a colander set over a bowl, sprinkle 1 1/2 pounds sliced tomatoes with 2 teaspoons kosher salt. Let stand for 1 hour. Press the tomatoes lightly. In a cocktail shaker, combine 3/4 cup of the resulting tomato water with 1/2 cup tomato juice, 1/4 cup plus 2 tablespoons vodka, 3 tablespoons lemon juice, 2 tablespoons dill pickle juice, 1 1/2 teaspoons grated horseradish, 1 pinch of pepper and 2 dashes each of Worcestershire sauce and Tabasco. Stir and pour into 2 ice-filled glasses; garnish with herb sprigs and serve. In a food processor, puree 1 1/4 pounds pitted and quartered peaches with 1 cup water, 1/4 cup sugar, 2 tablespoons fresh lemon juice and 1 teaspoon thyme leaves. Pour into 2 ice cube trays and freeze. Serve in white sangria or sparkling wine.